So it begins, much as it has begun before, not with a bang, but with a line and throngs of people 4 hours early. Yes, lines are a fixture at SDCC. You might say that SDCC veterans are professional line sitters. More, they know the secret, being punctual. Not your ordinary merely on-time punctual, but wildly obsessive compulsive punctual that’s standing at the door three to four hours early. A few years back I discovered (as did many others) that the Town and Country Registration crew are ready to go hours before the posted time for registration. 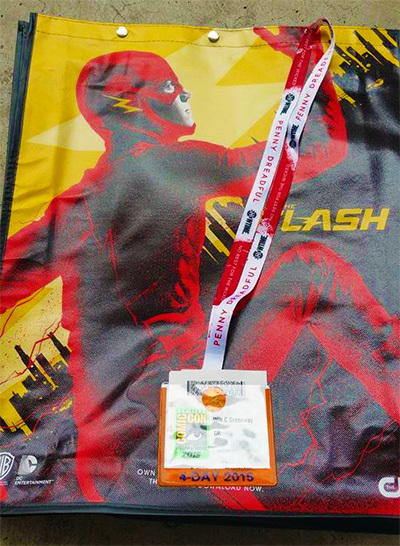 So, I’ve started meandering down around noon to sneak in and out with the badge stuff. It would appear that this practice has caught on. Yes, there’s just a smattering of attendees at this three hours early juncture. Mind you this is tiny fraction of the people that will attend (over 100,000). I guess that’s part of the excitement, to be involved in something that is relatively exclusive and just monumental in scale. The con fills the entirety of the San Diego convention center and holds events in 7 other venues as well. If you’ve never attended it, your first time will just blow you away. Here is what just the exhibit hall layout looks like. You lose a lot of detail at the width of the blog. You can click to see it in detail. To give you some scale, the hall is 615,700 square feet, just a bit under a quarter mile long. You can easily spend two full days just to fully explore the exhibition hall. That hall is roughly twenty percent of the experience. There are gaming areas, anime viewing theatres, educational seminars, and of course 4 and quarter days of programming. The programming is what I usually go to see. Hollywood premiers a lot of stuff at SDCC, and you can often see things weeks, months, sometimes years before they are shown to the public. A good example of this was two years before the movie came out, Guillermo Del Toro was shopping around the idea for Pacific Rim and getting conventioneers worked up about his giant robot movie Pacific Rim. 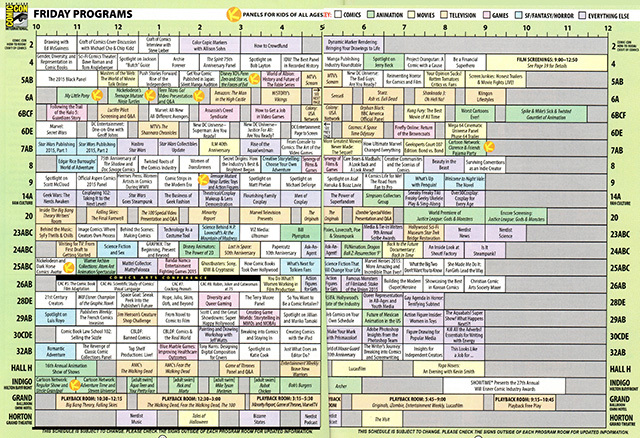 Here is a sample of one day’s worth of programming (note it runs from 10am to midnight)… this is also, just the convention center proper, not all the other venues. You’d hope that there was something interesting in all of that, right? There hasn’t been a year I didn’t get my money’s worth in terms of stimulation and entertainment. I hope with some of this revealed, those of you who’ve never attended can get a feel for why people can get obsessed with these events. Which is my way of asking you not to think I’m crazy. I’m fairly well adjusted. Really I am. This entry was tagged Articles, Comics, Update, Will Greenway. Bookmark the permalink.